There is no doubt purchasing an espresso machine for home is a big deal. They can be an expensive addition to the kitchen. But if you are a regular coffee drinker, investing in a good quality machine will actually end up saving you money. 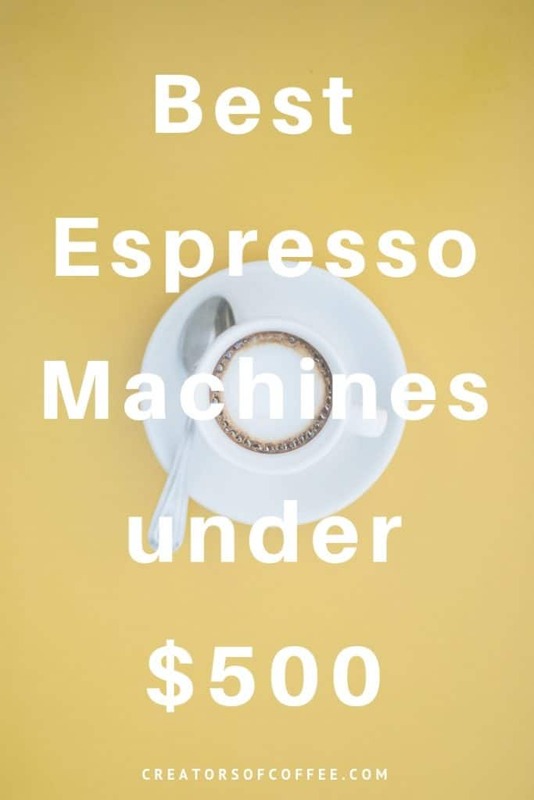 The great news is that with a budget of $500 you can find an espresso machine that is reliable, robust and can extract a good quality espresso. So if you are looking to make great coffee at home you have come to the right place. Here we review the best espresso machines under 500. Classic design, programmable features, PID technology and a full suite of accessories. The Breville Infuser is a standout machine and is the best buy espresso machine under $500. Check the price for our top pick here. All of these machines will have you preparing the perfect espresso in no time. In our espresso machine reviews section below we discuss the features in more detail. You may be wondering why we haven’t included any Nespresso pod coffee makers in our espresso machine reviews. To be honest, at this price point we just don’t think the Nespresso machines make the cut when it comes to making high quality espresso. I am sure many of you may disagree on this point! While there are a variety of pod machines on the market at different price points, we also don’t think there is much variation in their functionality. If I can’t convince you to consider one of the espresso coffee machines we review below, we recommend the Nespresso Essenza Mini. Compact and affordable, it comes in a range of colours and is fully portable too. It can be a little bewildering when you try and compare espresso machines. There are so many technical terms and different features. How do you decide what is the best espresso machine for home? Here are 7 considerations to help guide you when comparing the best espresso machines for home use. There are many types of coffee espresso maker. The two types we compare at this price point are semi-automatic and automatic espresso machines. An easy way to narrow your search for the best home espresso machine under 500 is to consider how you want to use the machine. How much do you want to learn vs just let the machine do its thing? With semi-automatic machines you are in control. You control the grind, tamp, extraction and how the milk is heated. With an automatic, the machine has more control. Typically they have a built-in grinder, preset buttons and generally less control over the extraction process. If you don’t have an interest in learning the ins and outs of making coffee, an automatic espresso machine may suit you better. On the other hand, if you are keen to experiment and learn, then a semi-automatic machine will give you more opportunity to develop your coffee making skills. When comparing the best espresso machines under 500, most will be semi-automatic. Simply because you get more value on a semi-automatic machine at this price point. We do recommend one automatic machine on this list. It is outstanding value, but generally you need to pay a lot more for a high quality automatic espresso machine. Looking for an automatic? Click to read our review of the best automatic espresso machines. If you drink coffee each day, usability is an important consideration. These are the things you will notice each day when you use the machine. Is it an easy espresso machine to use? Is the water reservoir easy to fill? Are the buttons simple to use? How easy is it to clean the machine? Can you fit your favourite mug under the portafilter? We highlight the main usability features in our reviews of espresso machines below to help you with your choice. Maintaining a consistent temperature when brewing and steaming milk is a critical aspect of making good coffee at home. Most espresso machines under $500 have a single water heater. This means the machine can complete one task at a time – heating the milk or extracting the coffee. The challenge is these two activities have different temperature requirements. Some coffee machines have a single thermometer to manage temperature. Other good espresso machines have dual thermometers to help deliver more consistent temperatures for both milk steaming and extraction. Best of all, some of the top espresso machines for home feature PID controllers. This advanced mechanism helps maintain temperature within a small range and are a common feature on more expensive machines. Let’s face it, everyone wants a nice looking espresso machine. Especially if it is sitting on full display in your kitchen. However, design is a very personal thing. Big, small, shiny, coloured, buttons or levers – everyone likes different things. Consider the design when you compare espresso machines and whether it will suit you and your home. 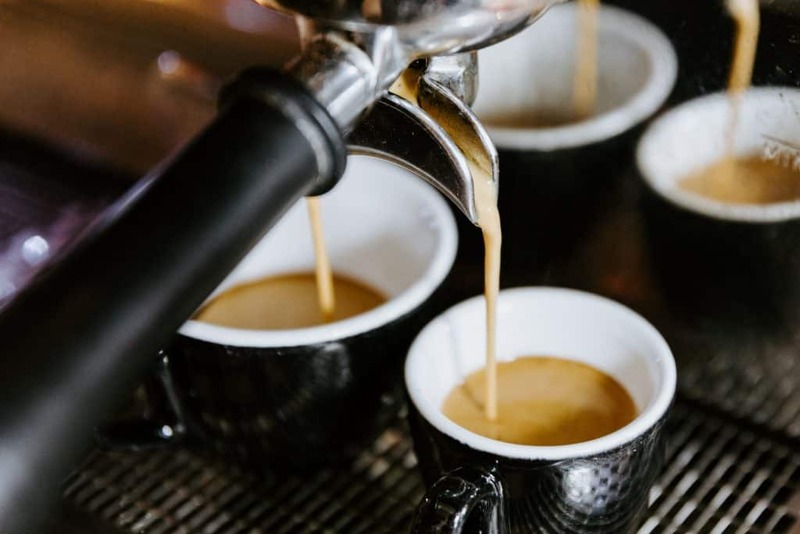 If you are a fan of milk based espresso beverages, a quality steam wand should be high on your list of requirements for at home espresso machines. Learning how to create creamy microfoam will transform your coffee at home experience from good to great. To make microfoam you need a powerful steam wand that can maintain a consistent temperature. Pannarello steam wands are included by many coffee machine brands on home espresso machines. They can be helpful on a beginner espresso machine or if you don’t often steam milk. However they can make it difficult to create perfect microfoam due to the large bubbles formed by some wands, so we recommend learning to texture milk without the panarello attachment too. It really doesn’t take long to master a manual steam wand and the results will be far superior. So if you love milk based coffees we suggest you check to see if the panarello attachment is removable. On a practical note, consider where you will store the espresso machine and how much space you have in your kitchen. Many countertop espresso machines are on the large size. Don’t forget you will need room for a good coffee grinder like this one, which should sit beside the machine. Ultimately you probably have a budget in mind when researching the best home espresso machines. This is one of the easiest ways to narrow your search when buying an espresso machine. We suggest you set your budget and choose the machine in your price range that meets your requirements. 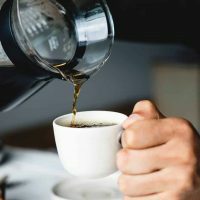 We review $500 coffee maker options here, but if you want to spend less it is possible to find good affordable espresso machines under $200. There is, however, a noticeable step up in the quality, design and construction of espresso machines priced from $200 to $500. Now that we have covered off how to compare espresso machines, let’s take a look at the best semi automatic espresso machine reviews. 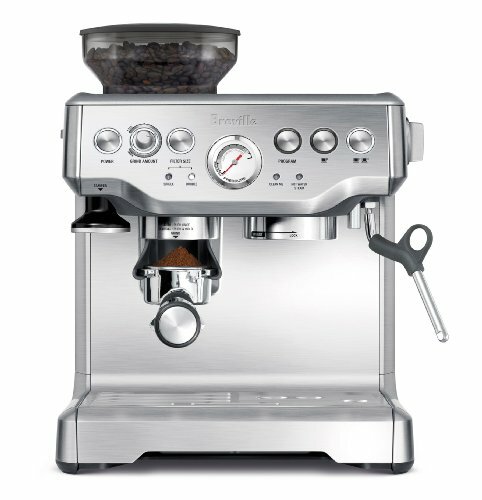 Breville is an Australian company and a relative newcomer to the espresso machine market in the USA. What we love about Breville Espresso Machines is how many high-end machine features are included on their mid-range machines. 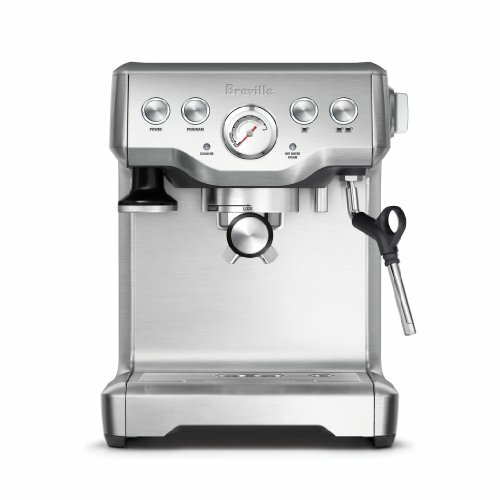 Breville The Infuser is the perfect package for beginner and experienced home baristas alike. Separate hot water spout for warming cups or making americano style coffee. The water heater is a 1650w thermacoil with a stainless steel element. The inbuilt PID controller reduces temperature fluctuation. Combined with the auto purge function the machine delivers optimum temperature for both espresso and steam. As a result the machine can pull consistent high quality espresso shots and produce creamy microfoam. The pre-infusion function is a superb feature on this machine and is another reason why it can produce consistent espresso quality. The grinds are first soaked in water at low pressure to gradually expand the coffee grinds and ensure a more even infusion. The pressure is then increased to produce perfect espresso and crema. The dry puck feature means no messy cleanup afterwards. The Infuser comes with 2 preset buttons for 1 and 2 cup coffee. Each button is programmable with full volumetric control. You have flexibility to set your preferred volume AND override manually if preferred. The large water reservoir is easily removed to fill and comes with a replaceable water filter for better tasting water. The pressure gauge is another feature not seen on many machines at this price point. As one Breville BES840XL review said, this is perfect for the beginner barista as you get instant feedback on the extraction pressure achieved with your grind and tamp. I found this feature really useful when starting out at home. The Breville Infuser espresso machine has a high quality brushed stainless steel design, removable drip tray and tall cup clearance so you can fit your favourite mug under the portafilter. The size is pretty standard for this type of machine at 13.7″ x 11.5″ x 13.2″. 4 portafilter baskets – single and double shot single and dual wall (pressurised) baskets. It is the electronic PID temperature control, pre-infusion function and powerful steam wand that set this machine apart from the rest in this list. With a range of intuitive design features and the ability to pull consistently good espresso, the Breville Infuser confidently takes our number one spot for best espresso machine under $500. It is a great machine for black coffee and white coffee drinkers alike. The Gaggia 14101 Classic espresso maker is a firm favourite amongst the home barista community and one of the best rated espresso machines. The Italian company have been making espresso machines for over 70 years and are one of the most respected names in the industry. 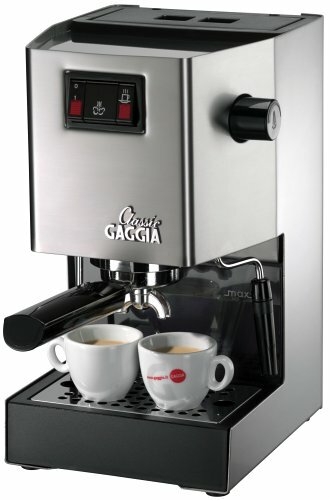 The Gaggia Classic is a powerful espresso machine housed in stainless steel with a slightly retro design. This particular model has been around since 1991 and has not changed much in terms of design (can you tell ;). Whilst smaller than the Breville Infuser this machine can pull a great espresso and deserves its place on our list of top espresso machines under 500. Standard 58mm commercial size portafilter. With its simple switches it is an easy machine to use. Unfortunately the water level is a little difficult to see due to the tinting on the container, but at 72 oz it is one of the larger water reservoirs available. Its compact size at 9.5″ x 8″ x 14″ also makes it a good choice for small bench tops and kitchens. The cup clearance is shorter than the Breville Infuser and you will need some demitasse cups to fit under the portafilter. The chrome plated brass group head and portafilter assists retain heat and the three way solenoid valve ensures dry pucks and an easy clean up. This machine can produce consistent high quality espresso shots, but falls a little short its pannarello steam wand. The pannarello removes some control over texturing the milk and tends to produce larger bubbles and poorer quality microfoam. The attachment is removable but you may find the wand a little short once you remove it. Sadly there is no PID controller on the Gaggia Classic, although it is possible to manually add one if you are mechanically handy. The machine comes with both pressurised and non-pressurised filter baskets and a plastic tamper. TO be honest the plastic tamper isn’t great. If you want to achieve the perfect shot you will need to purchase a quality 58mm tamper. While the Gaggia has less features than the Breville Infuser, it can produce consistently good espresso and is also a cheaper machine. Gaggia has a loyal following amongst coffee drinkers worldwide and there are user forums where you can seek advice on how to get the most out of your machine. If you drink your coffee black, it is a strong contender for best espresso machine under 500. The Duo Temp Pro is one of the best entry level espresso machines. With many of the same features as the more expensive Breville Infuser you could well ask, why pay more? For beginner home baristas on a tight(ish) budget, the Duo Temp Pro espresso machine is a great choice. No fancy features, just high quality construction and consistent quality espresso. So what features does the Duo Temp Pro share with the Infuser? What is the difference between the Duo Temp and The Infuser? The Duo Temp does not have programmable buttons to control shot volume. This machine is fully manual with no automatic flow stop. It doesn’t have the advanced temperature control to modify the water temperature. Some would say these two features are easy to sacrifice for the cheaper price. In fact we think it is one of the best espresso machines for the money. The Duo Temp Pro is also a slightly smaller machine at 11″ x 10″ x 13″. It still comes with the same great range of accessories including stainless steel milk pitcher, tamper, dose trimmer and 4 filter baskets. 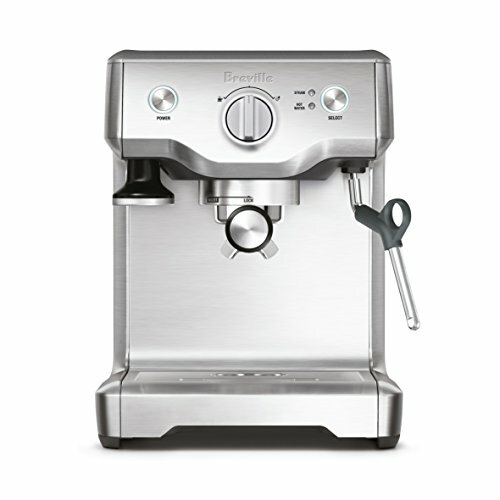 The Breville Duo Temp Pro has high quality stainless steel construction and many features reserved for more expensive machines. Despite the manual controls it is still one of the best semi automatic espresso machine options at this price point. If you secretly love the sleek narrow design of the Nespresso, but are an environmentally aware kind of person looking for the full fresh bean experience, the DeLonghi Dedica is a match made in heaven. At only 13″ x 5.9″ x 12″ it will comfortably fit on any countertop. It comes in a choice of colours including fire engine red, white, black and silver. DeLonghi have been in the business of espresso coffee machines for a long time and are rated highly for their quality and reliability. 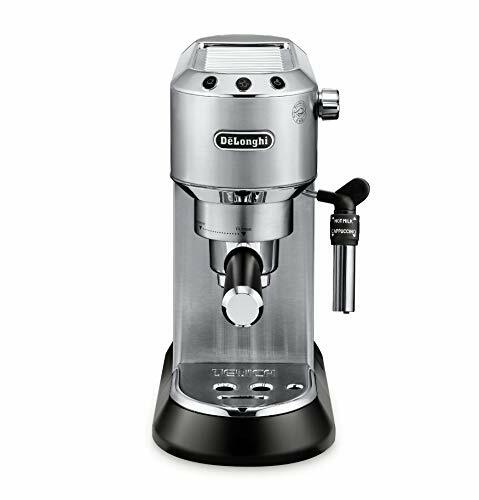 We like it’s slimline design this DeLonghi espresso maker has earned its place on our list of top home espresso machines. This powerful small espresso machines has a thermoblock heating system. Due to its small size it will be ready to pull your first shot in under a minute. 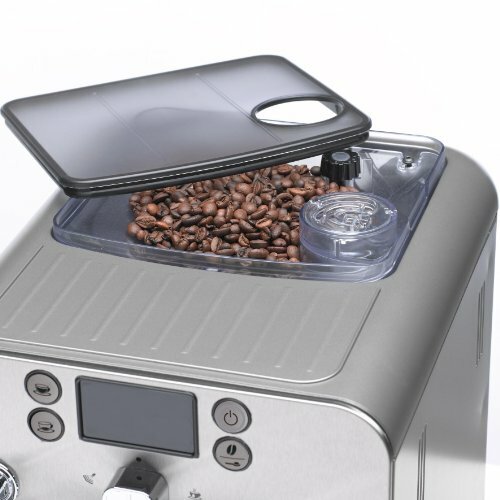 It has 2 programmable shot buttons and automatic flow stop, portafilter baskets for both ground coffee beans and ese pods, programmable water hardness and a built in descaling program. There is no dual temperature control function so you will need to wait in between pulling shots and running the steam wand to ensure you are running at the right temperature. The adjustable cappuccino system on the steam wand is a unique feature in this group of espresso machines. It has a regulator ring to control whether you want to heat milk, create foam or dispense hot water. The DeLonghi Dedica Deluxe has a flexible drip tray to fit taller cups, an optional water filter and a cup warmer. Note that the portafilter is smaller than most other machines and you will need to look for a 51mm tamper like this one. This DeLonghi espresso coffee machine is a well featured home espresso maker with the support of a great company. While the quality and depth of flavour in the resulting espresso is perhaps not as good as larger machines, it is an excellent alternative to the Nespresso suite of machines. The Breville Bambino Plus is a new small espresso maker with so many great features that make it a really good espresso machine for home. Automatic steam wand: Set your preferred milk temperature and foam quantity and the machine does the rest with the use of a unique sensor in the tray of the machine. Perfect textured milk every time. Rapid heating time: the Breville Bambino is ready to go in just 3 seconds. There is a large 64 ounce water tank, cup warmer, 54mm portafilter and a modern stainless steel casing. 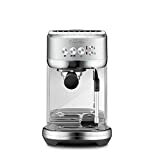 This Breville espresso coffee maker is a simple espresso machine to use and is one of the best compact espresso machine options on our list. The innovative automatic steam wand also makes it a great cappuccino machine for home. It is a great choice if you want to enjoy milk based espresso coffee, but are nervous about learning how to make barista quality textured milk. If you are looking for a budget super automatic espresso machine then the Gaggia Brera super automatic espresso machine is a great choice. While Gaggia calls it super automatic, I would call it automatic – the manual steam wand still requires you to froth the milk. 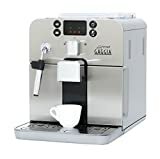 However, putting terminology aside, this quality espresso machine offers a lot of great features for people looking for an automatic machine. 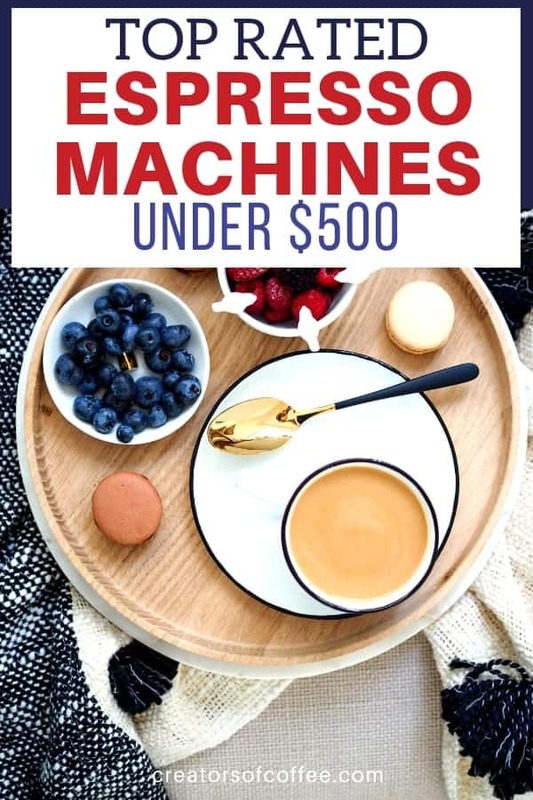 You might recall we mentioned it is tough to find a good quality automatic machine in this price range. 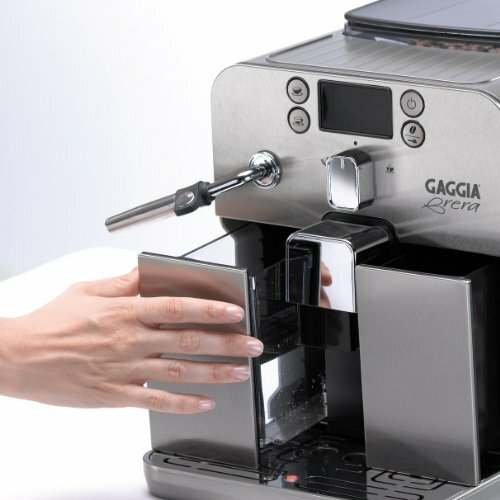 The Brera espresso machine is the exception, with many positive gaggia reviews. Unlike many automatic machines it has a simple control panel. There are 2 programmable settings and 3 coffee strength settings. The removable brew group will require regular cleaning to prevent blockages and the grinder doesn’t really tolerate oily beans. But the direct beans to brew system results in the freshest grinds for every cup of coffee. The exterior casing is stainless steel and it is a compact espresso machine at 12.4″ x 10″ x 17.4″. If you are looking for a superautomatic espresso machine with integrated grinder close to the $500 price point, you can’t really go wrong with this coffee and espresso maker from Gaggia. It is a good espresso machine for home use. If you plan to purchase a separate grinder, another espresso machine to consider is the Breville Barista Express. I know, I know we are getting off track from the espresso machines under 500 dollars, as I want to be clear this espresso machine is more than $500, but hear me out. 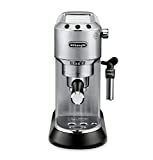 With all of the features of the Breville Infuser but with the addition of an integrated grinder, home espresso machine reviews consistently rate the Breville Barista Express as one of the best entry level espresso machines on the market. It is more expensive than any of the coffee espresso machines we have listed here, so I accept I may have thrown you a curve ball. But it comes with a high quality integrated grinder, which don’t come cheap. So overall you will likely save money if you are in the market for the best espresso machines with grinders. The Breville Barista Express is a worthy challenger to the machines on this list for those who can stretch the budget a little more than $500! Once you have your new espresso machine, it will take a little practice to pull the perfect shot of espresso. It helps to start with best beans for espresso machines. 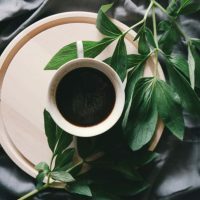 If you have a sensitive stomach check out our short list of the best low acidity coffee beans here. To fast track the learning curve, here is a great video outlining the key steps to mastering your espresso machine. Remember, this is only a guide to get you up and running. Everyone will have their own taste preferences and style. Once you understand the basics, the best thing to do is experiment. Try different methods of grinding, tamping and texturing milk to achieve the best espresso on your home machine.